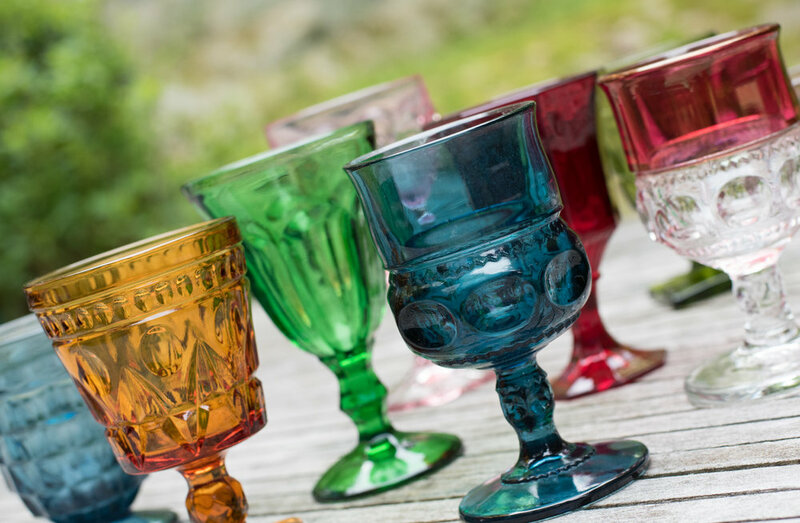 Vintage Glassware... you asked, we listened! A tisket a tasket, we are adding to our vintage basket! Whether it be a vintage picnic, a 50th birthday or a wedding... we have all your vintage glassware needs covered! With hundreds to choose from, we know your table will outshine anyone else's! One, Two, Three... it's all about me! Our first birthday bash went off with out a hitch! Congratulations to Abbey Elliot and Billy Kennedy on their amazing day! It's finally here... Valentines Day. It's one of our favorite days around here because it's all about love! How many of you have been planning that dream wedding, that dream engagement? Our favorite finds this past year have been this foursome of plates that coinside with this great day! So whatever you have planned- make it a special one! If you are looking for bright pinks, shiny reds or something special to perk your day- let us help! As many of you know Brimfield Antique Show is basically along the lines of Christmas for me at Borrowed. It's a full week of picking! The thrill of waiting in line for a new field to open is right up with the smiles of bumping into people you know and showing your loot! The past two times I have included my father in this trip. We scour the fields, and it totally brings back memories of hopping in the car and heading to Vermont to find the perfect dresser for the house when we were younger. Items on our bucket list seem to change daily as we find pieces that we know a sibling or a friend would cherish, but it's all in a days fun... because let's be honest- it doesn't feel like work up there! So if you are looking for a great road trip this weekend, we suggest Brimfield! It's less than 2 hours from Norwalk CT, so less than 3 hours from New York. Take a break from the Brooklyn Flea and pack a lunch! If you can't make it all the way up to Brooklyn, we will be at the Elephants Trunk Flea Market this weekend on Sunday to catch all the vendors on their way back... it's a weekend you don't want to miss! We can't stop thinking about this day, click the link to read more about our wonderful vintage adventures in Brooklyn! On Friday's we at Borrowed VOGUE! This amazing day was lead by the uber talented William Parkinson Events! Borrowed was honored to be included... it's gorgeous, need I say more?!?! Gushing over this delicious winter wonderland shoot led by the amazing Stella Day Events! to tell me that I need to blog!! A friend, mentor, someone I deeply have a mad girl crush on, has been telling me that I need to blog. Immediate thoughts (and thoughts for the past few months) were: why should I blog? What do I have to tell anyone? Why would anyone want to read it? And while I am still pondering the answers to all said questions, I realized that I sat here this morning and caught up on all my friends - BLOGS! It's our busy time of year but I somehow still feel connected with my wild and crazy event industry friends through eachothers social media posts. Yes, when I see you next I will probably comment about something I read about, where I should be picking up the phone and calling you to discuss but I promise come November (maybe) I will be human again... until then, I promise you a weekly Blog post. So, as you blissfully sip your coffee (we do that right?!?! ), you now can catch up on Borrowed too!